This fabulous wash bag is an ideal container for your pampering essentials! 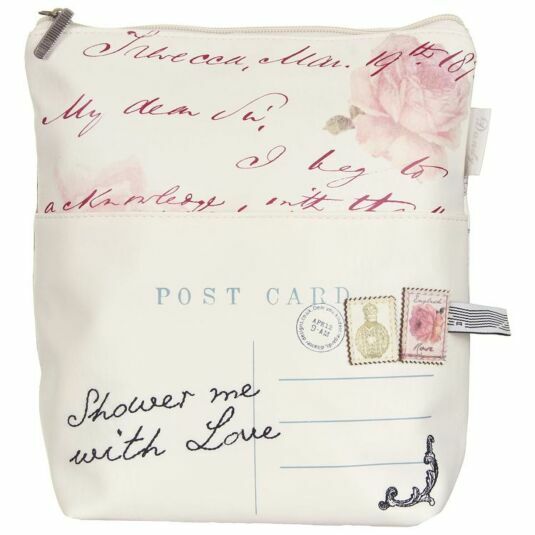 The stylish design features a romantic letter print on the front and a postcard inspired pocket with embroidered words "Shower me with love". The back of the bag has a print of a colourful stamp collection. 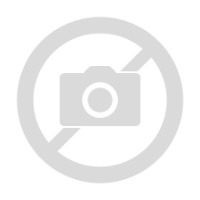 The bag has a zip closure and the side pocket has a magnetic clasp. Inside is lined with dotty fabric and has a zipped pocket for any small bits and bobs. It makes an ideal gift for a frequent traveller or someone who simply cannot part with her cosmetics, with a broad appeal across all ages, from teens to mums to grandmothers! The Dandy Range from Disaster Designs combines femininity with wit. Each piece is made from pale cream soft faux leather, printed with vintage roses and romantic phrases in a deep pink script. The design is of an old fashioned-postcard with appliquéd stamps and 19th century boudoir imagery. Each item has an embroidered phrase on the message area of the postcard which is appropriate to the item. Lovers of romance and soft colours will enjoy these bags and wallets, which are practical and useful, as well as being delightful objects.